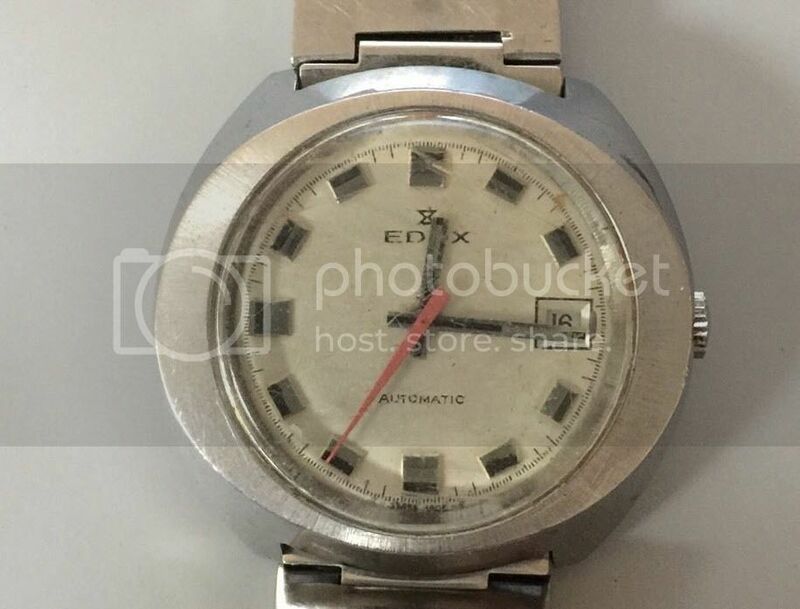 I recently completed a restoration of an older Edox automatic. 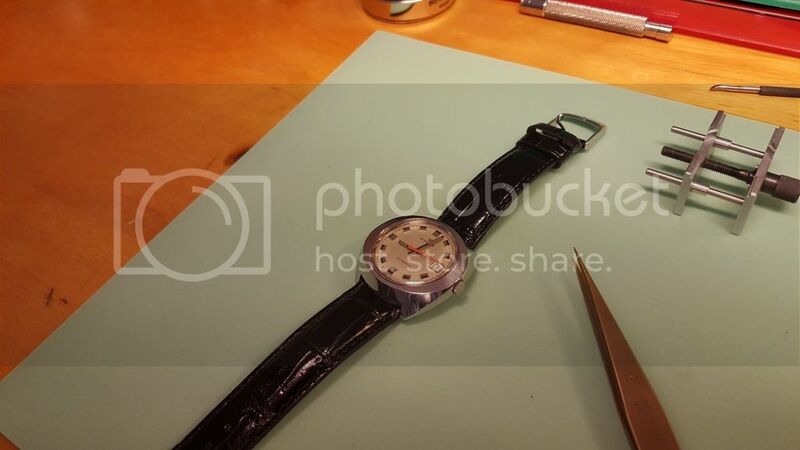 At Machiel's suggestion, I thought I would share the project on illustrate how I brought this vintage piece back to life. The movement was an ETA 2783. It was locked up and not running. I couldn't even set the time nor move the hands in any way. I could get the balance to move a bit, so I knew there was hope. 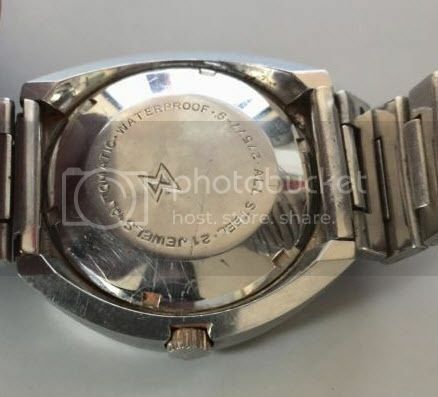 It also appeared that the watch had been submerged, I'm guessing brackish or sea water. 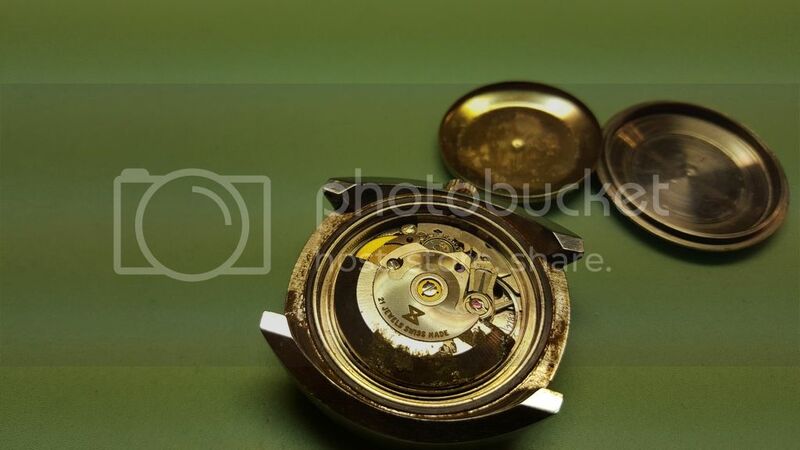 There was brown residue around the caseback and in/around the crown. Once I managed to get the back off, I knew this was going to be a bit more challenging. But, I was also relieved that the entire movement wasn't a pile of rust. 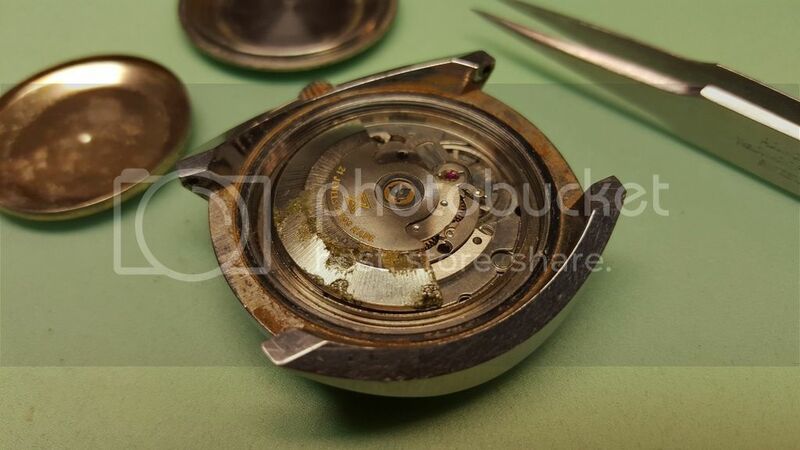 As you can see, there was considerable corrosion of some sort on the oscillating weight, and around the edge of the case. Even with helping the wheels a bit with a piece of pegwood, I coudn't get anything to turn with the crown. 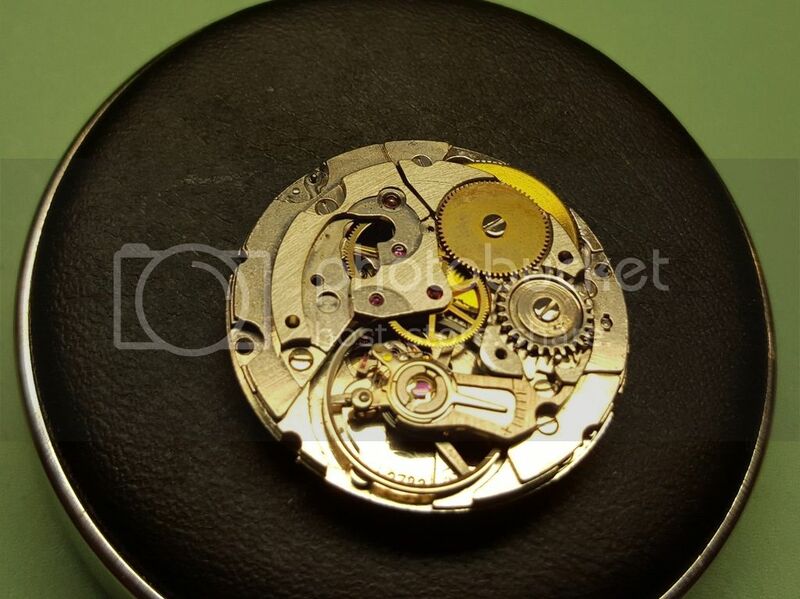 After pulling out the movement, it appears that in general, the movement was in good shape. The strange part, was that I had trouble removing the main train bridge. I then took pegwood and applied a bit more pressure to remove, and it finally gave way. Unfortunately, I learned a lesson here. 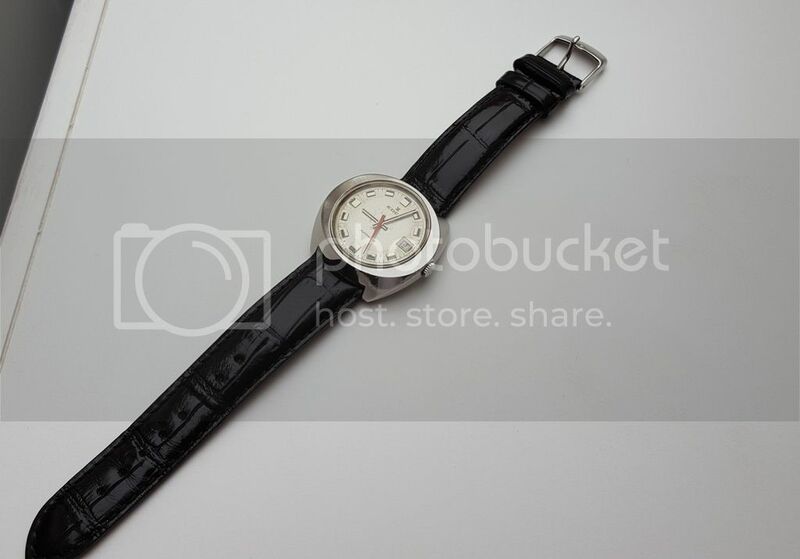 Apparently, since this watch had sat around for probably many years, with some type of moisture inside (with salt?) 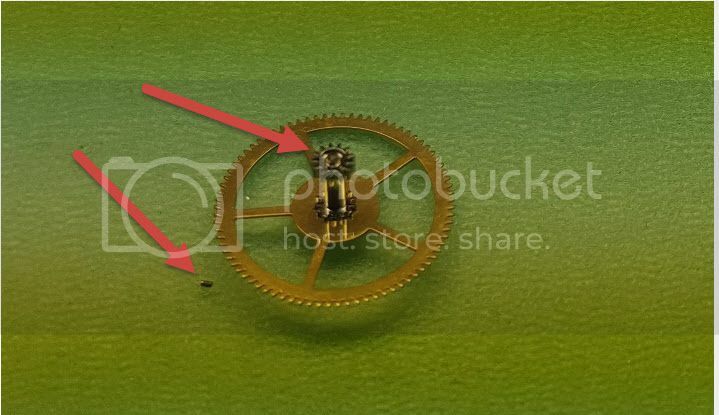 the pivots had become permanently stuck to the pivot jewels in the bridge. 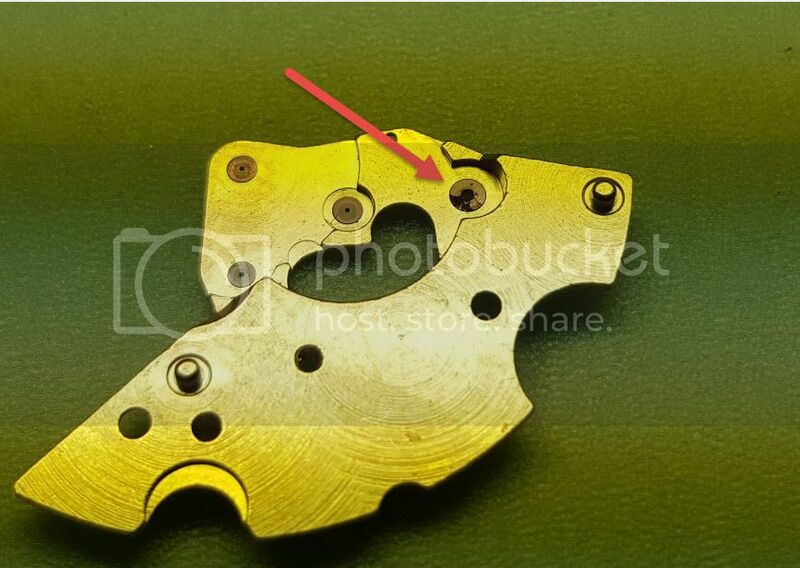 When the bridge finally came off, it cracked the center wheel jewel, and even left part of the pivot in the jewel. 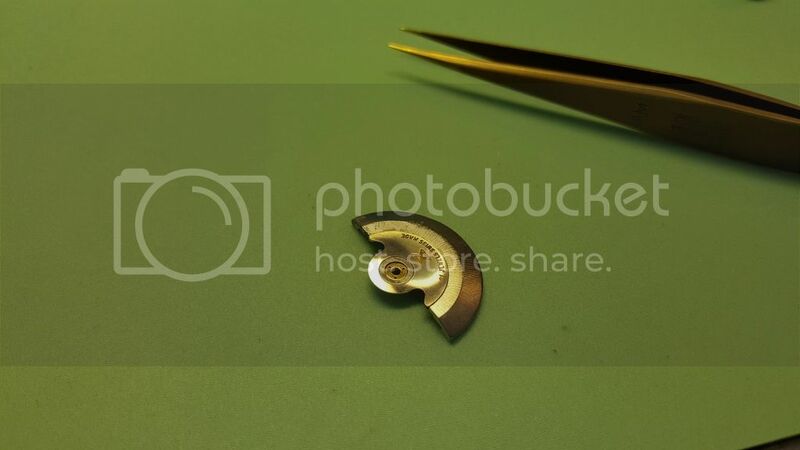 Next time I see a frozen movement that visibly looks to be in good shape, I will consider soaking the entire movement in something that may loosen up or remove some of the corrosion in and around the pivots. Notice what remains of the pivot to the bottom left of the center wheel. At first glance, I thought I had lucked out with the date wheel being in good shape. But, unfortunately the number 2 was bad enough to make me want to replace it. I tried to gently see if any of the residue would come off without damaging the paint, but no luck. A week of so later my parts came in, a new date wheel ready to drop in. I took the oscillating weight and soaked it overnight in my favorite rust removal solution. (It can be obtained at most auto parts stores.) 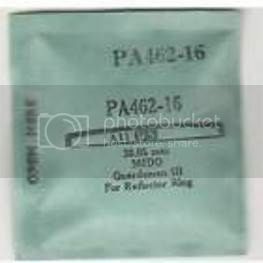 The chemical reaction is non-toxic, and has a two-stage chemical process that removes all iron oxide from any type of steel. After soaking and running through my cleaning machine, I used a fiberglass pen brush and finished it off with 1000 and 2000 grit sandpaper to help remove what residue remained. 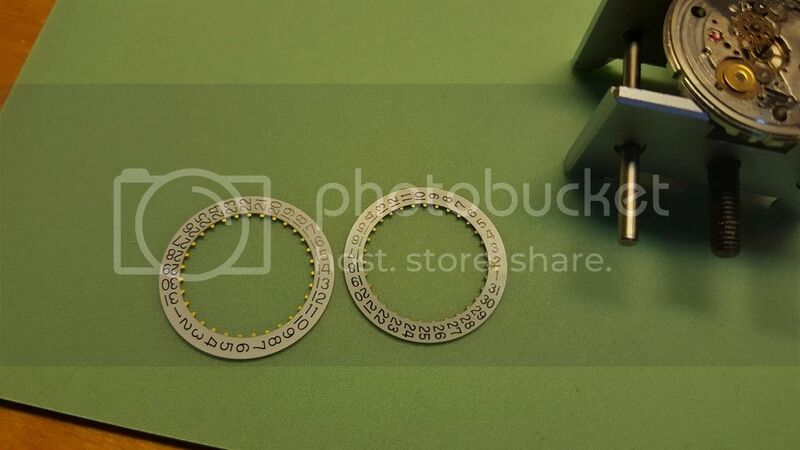 I covered the gold inlay lettering and weight bearing with rodico to prevent damage and to keep the sand grit and debris from getting into the recessed lettering. 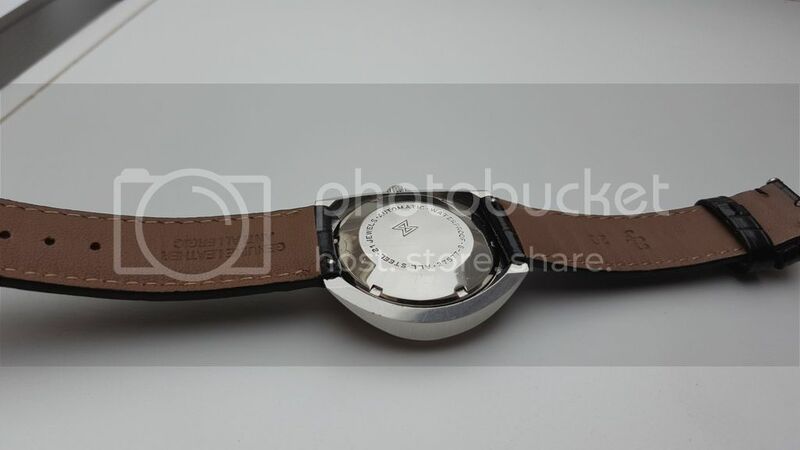 Ultimately, some of the pitting is still visible, but overall not a bad trade since I get to keep the original signed oscillating weight intact on the movement. Now on to finding a replacement crystal. 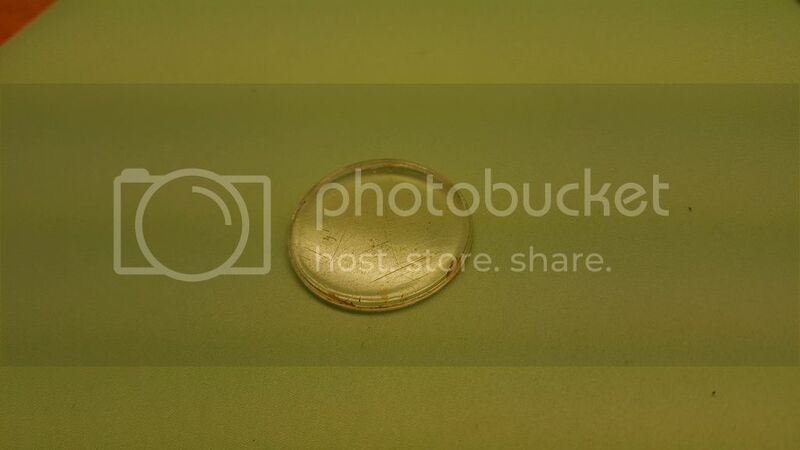 While I was trying to remove the old one, it actually broke off all around the rim of the bezel. I had to take pegwood and some solvent to remove all the old glue and remaining stuck plastic. In researching, I couldn't find a direct reference to this somewhat rare vintage manufacturer. After measuring the width of crystal opening about 20 times, I settled on the width and height I felt was the closest match in my vintage GS crystal catalog. Had to use heat in order to get the signed crown to come off the old rusted stem. Luckily, the threads and crown shoulder were not damaged. Heating up a stem to loosen is a bit risky, one has to be very careful not to overheat. 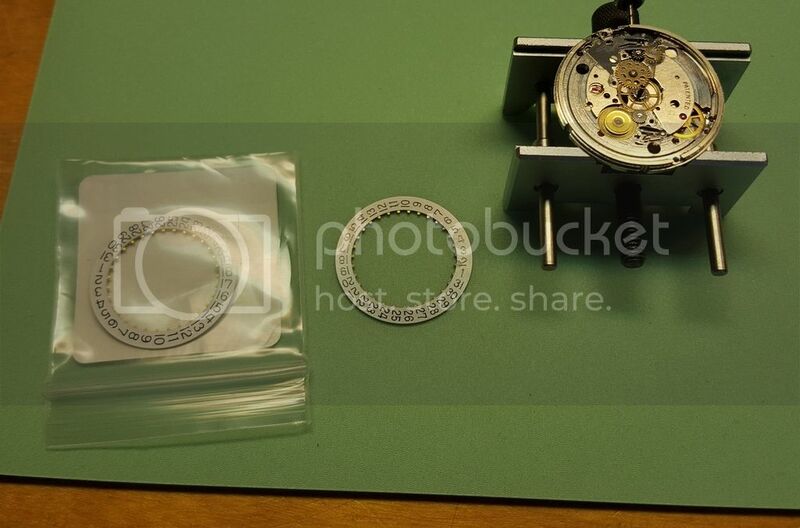 I polished the case & case back, fitted the crown to a new stem, and then on to regulating and timing. 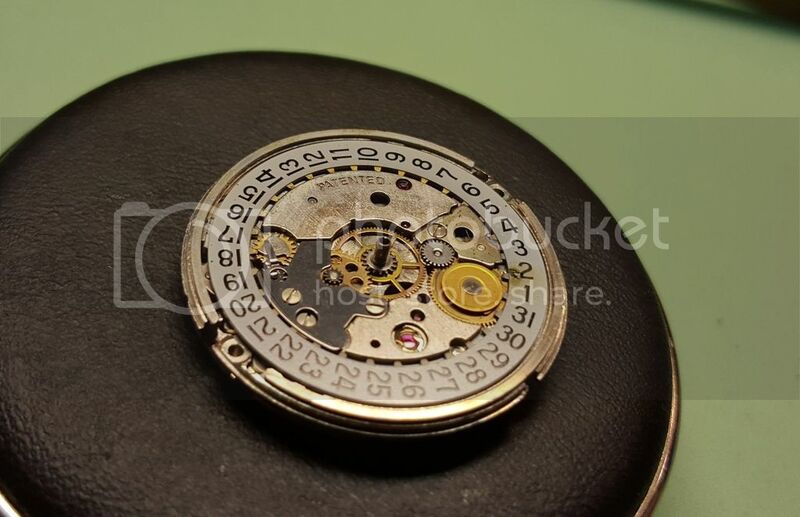 The initial regulating after cleaning the movement showed promise on timing and beat error...will it still be in good shape after re-casing? Good result, especially considering the frozen movement and being 40 or so years old ! 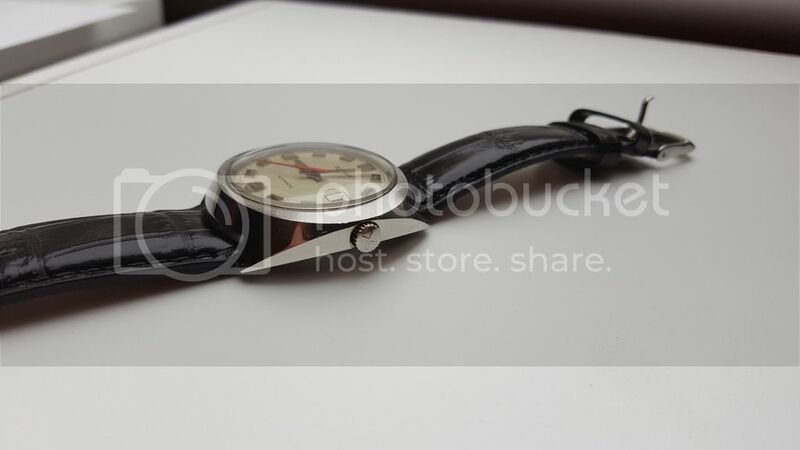 A new leather band...and some additional polishing & cleaning with a cloth, and she is all ready to wear again!! The sides of the case look fine and was very pleased with the crystal fit. I was even able to retain and leave in the original reflector ring underneath the new crystal. That's hard to do! I lucked out with picking this particular crystal. There is still a bit of discoloration around the number markers from where the dial got wet. 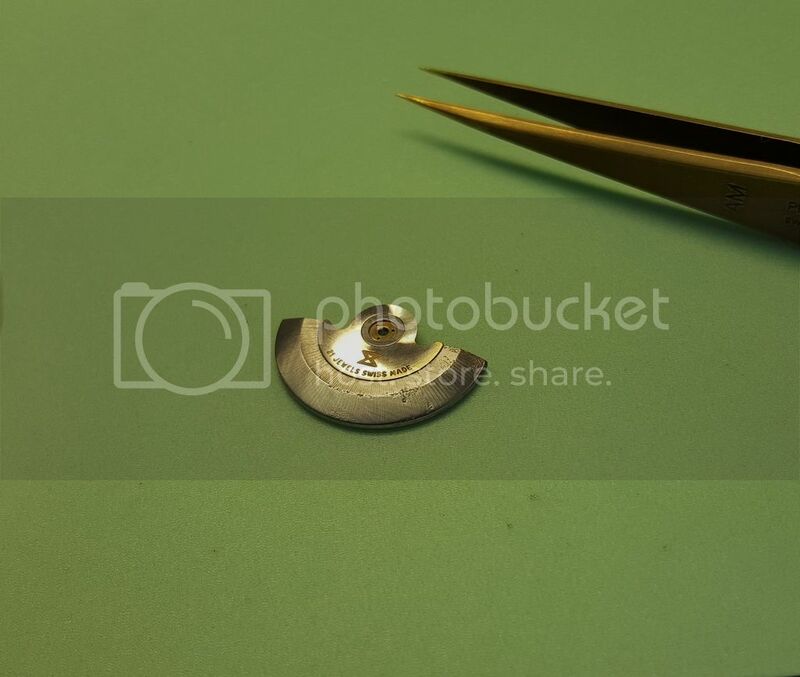 I've learned that it's best to leave vintage dials as they are, as it is almost impossible to clean them without damaging or removing bits of paint, leaving you with the feeling that it was best to just leave it alone. Overall, pleased with the outcome. Always fun to bring new life to a vintage piece!